We try to keep things fresh here at The Infatuation. Most of the time that means staying on top of the latest New York City dining trends, whether it be the hottest new openings, that time we got another BBQ restaurant, or anytime anyone does literally anything with a donut. That’s what food writing is all about these days. Following trends and discussing them until they die. Other times, keeping things fresh means going back to some of the oldest restaurant reviews in our system to see if anything has changed over the last five years - or at least just to take out all the references to LOST and The Black Eyed Peas. Is there a chance you’ll still understand what we meant when we said we wanted to “eat that gnocchi like Hurley alone in the hatch with a sack of candy bars?” Possibly. But we’d rather not take that risk. Our original review for Il Buco contained no such reference, nor was there any mention of will.i.am, Fergie, or the girl in that group. 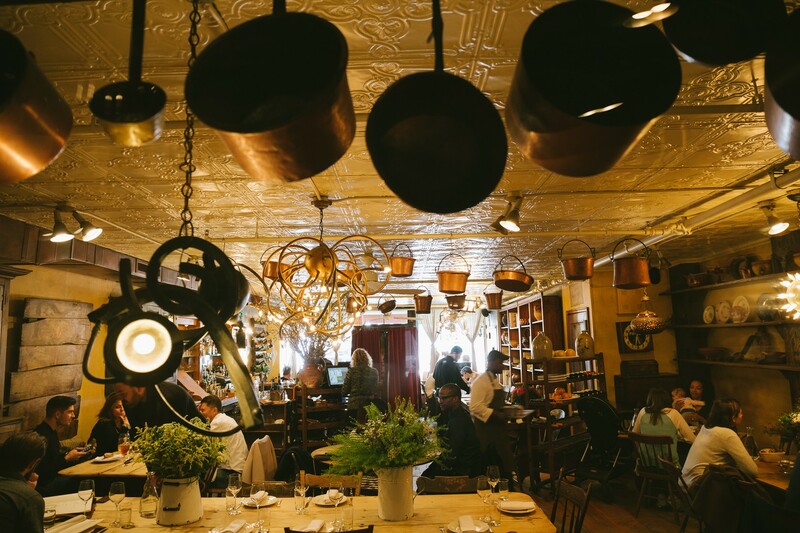 But it was time for an updated review for one simple reason - this is still one of the absolute best restaurants in New York City, and we want to remind you of that. We published our first Il Buco review back in 2009, but we never stopped eating here. It’s been in our Date Night rotation since basically the beginning of the decade, and it’s also at the top of our list when people visiting New York for the first time ask us where they should eat. Start with Il Buco, then fill in the rest. Why? Because there still just isn’t any place like it. Show me another restaurant in this town that was originally an antique store, has a 200-year-old wine cellar that Edgar Allen Poe used to chill in, and is so romantic that you’re pretty much guaranteed to see people trying to Fergie each other at the table if you hang around later than 10pm. It doesn’t exist. That very fact is what led us to actually increase our rating on Il Buco, even though it is exactly the same as it always has been. This restaurant is still better and more special than almost everything that has opened up around it since 1994, and longevity and consistency have to count for something. In this case, they count for half a point and a brand new review - one that’s full of fresh and topical references. A “caesar” salad with black kale. Ten years ago this was an exciting fresh new concept, and now you can get one at Sweetgreen. Progress is a beautiful thing. Get one anyway. Pasta needs to be happening on your table. If you see torchio available, you order it. What is torchio exactly? We’re not sure, but we’re guessing the dish gets its name from the shape of the pasta, which looks very much like an Italian guy named Torchio. Again, just guessing. The other ingredients will vary depending on the season, but all you really need to concern yourself with is how perfect the rice is cooked in Il Buco’s risotto. Everything else is just a bonus. Here’s an important piece of menu advice - eat a piece of fish. It might seem boring compared to all the other excellent things you can eat at Il Buco, but you won’t regret it. Whatever they are doing back there to make a piece of arctic char taste as good as it does, you want in on it. We’re always down for some crudo, and Il Buco makes a good one. Feel free to kick your meal off this way, especially if you’re sitting outside with a glass of wine. When have you ever eaten a dessert that includes some kind of pastry, some kind of fruit, and some kind of ice cream and not loved every second of it? Right.